Fans of John Green and Rainbow Rowell will absolutely love this debut novel by Estelle Laure. 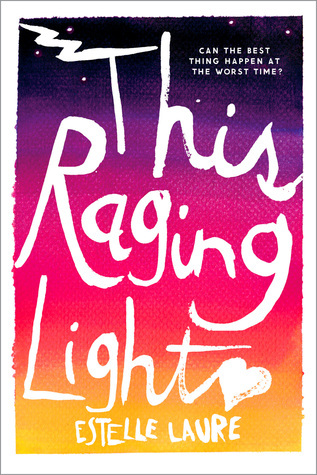 This Raging Light has the YA "it" factor of keeping you hooked and hoping. Lucille is forced to grow up early. Her dad is not normal. Her mom never came home from a vacation. Lucille has bills to pay and a little sister, Wrenny, to look after. As if life isn't complicated enough, she falls in love with her best friend's twin brother, Digby. 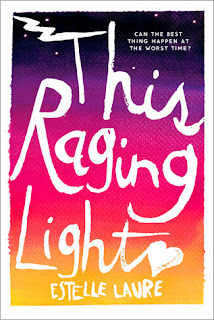 This Raging Light is a YA story of a girl who learns that life and love can be unexpected yet amazeballs. Some book reviewers were let down. I will admit if you go into this book expecting shooting stars, rainbows and fireworks then yes you'll be disappointed. Also don't read this novel thinking it will be better than some of your favorite YA novels; it is only similar. Give This Raging Light its own lane then get behind the wheel and take it for a test read. Estelle, do me a favor and hurry with the companion novel These Mighty Forces. I need to know what happens next.